The coconut crab (Birgus latro) is the largest terrestrial arthropod in the world. The spectacular huge crustacean can reach a weight up to 4.1 kg and a length of up to 1 m (from leg to leg). Coconut crabs continue to grow during their entire life that can span over 40 years. This explains their massive size. The coconut crab lives on oceanic islands across the Indian Ocean and parts of the Pacific Ocean, where the coconut tree grows. The coconut crab flesh is considered a delicacy or a great aphrodisiac in some places. Thus, this crab species is intensively hunted. The human expansion is another factor that threatens this species to become in danger of disappearance. The arthropod has been already extirpated from Australia and Madagascar. 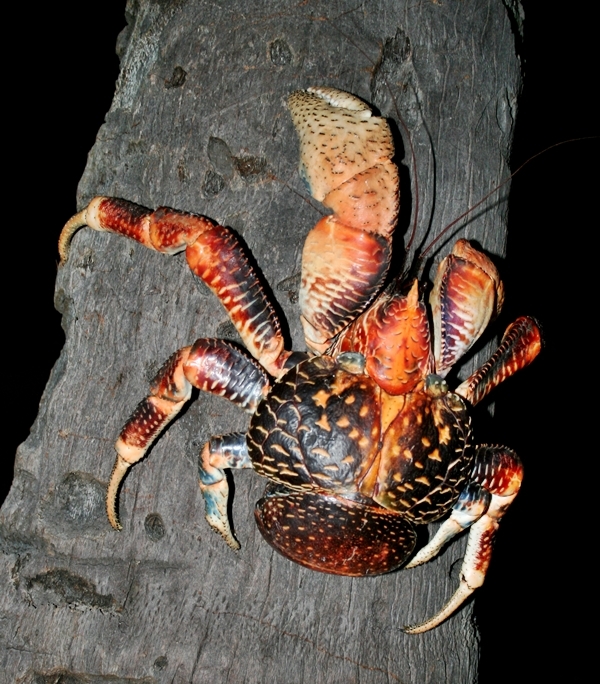 Coconut crab received its name because of its unique behavior of eating coconut. The coconut crab is famous for its large and strong muscular claws. 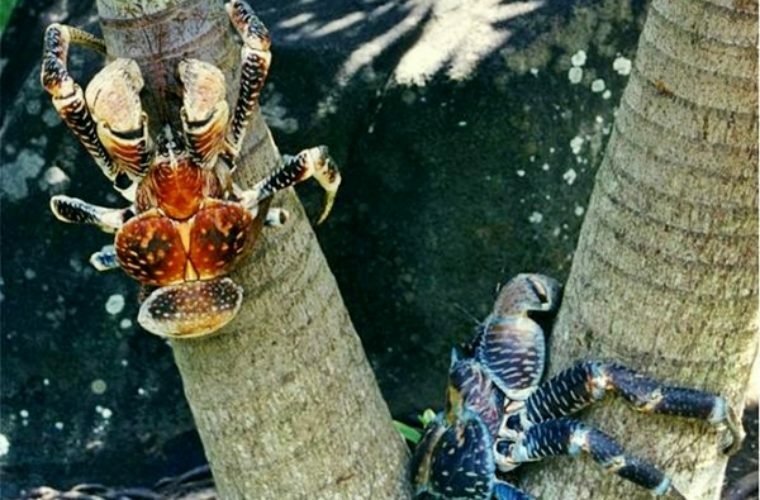 With the help of the claws the crab climbs up a palm tree, picks up a coconut and drops it from a height. Then the crab drops itself from the tree. In this way the coconut crab succeeds to open the shell of a coconut and eat it. Another explanation of the name comes from the crab’s habit to use coconut’s shell to protect itself when it is young. 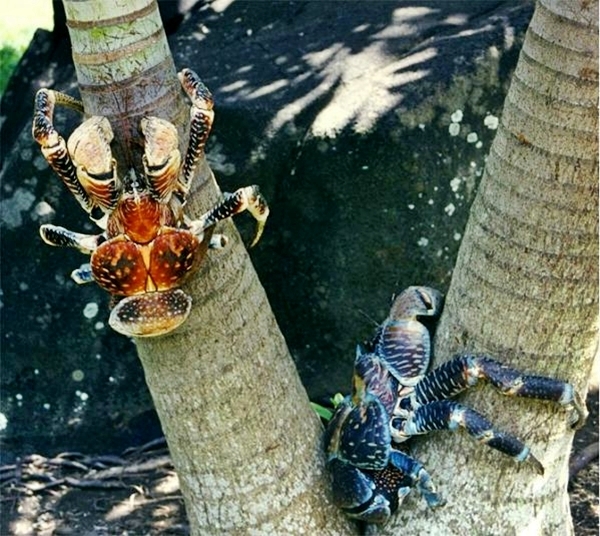 The coconut crab is also known as robber crab or palm thieves. People believe that crabs used to steal shiny items such as pots and silverware from houses. Coconut crabs have an interesting biology. The species has adapted so well to live on land that it can drown in the water. But the water is still very important for the coconut crabs. Actually, they spend their first weeks of their lives in the ocean. The females keep the eggs in their abdomen until they are ready for hatching, then releases them in the water. In the ocean, the eggs pass through an amphibious stage and then become young crabs. During the adult life the water is used for breathing. Although its gills are modified, the crab still use it for breathing. The crab dips its legs into water and passes them over the gills. In this way the crab keeps a necessary moistness for the spongy tissues that are surrounding their gills. 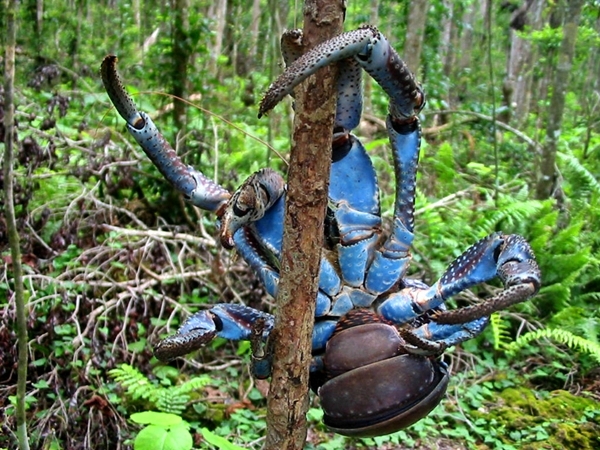 Coconut crabs can be found in different colors that vary from purplish-blue to orange-red. The main food diet is based on fruits, leaves and anything organic. In some islands coconut crabs have limited protection. 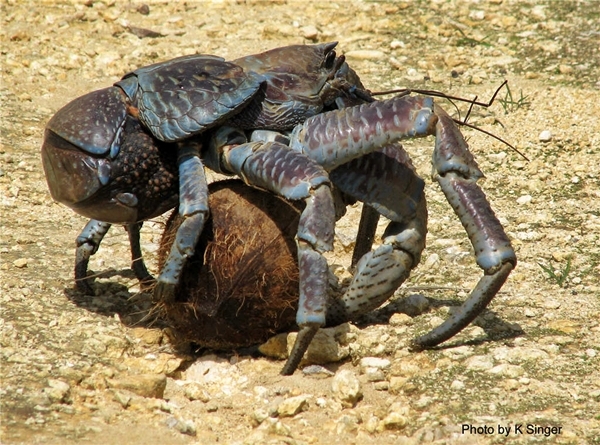 In Saipan Island, for example, it is prohibited to collect coconut crabs during the mating period (between 1st June and 30th September). The coconut crabs can become an endangered species due to increase in human population, tourism development and hunting.